Michael Adams received three degrees from the University of Michigan and taught at Michigan, Albright College, the University of Iceland, Duke University, and North Carolina State University before joining the Department of English at IU. He mostly studies the history of English, but he also teaches courses on literature and writing. He has written or edited several books, including Slayer Slang: A Buffy the Vampire Slayer Lexicon (Oxford, 2003), Slang: The People’s Poetry (Oxford, 2009), From Elvish to Klingon: Exploring Invented Languages (Oxford, 2011), and In Praise of Profanity (Oxford, 2016), as well as (with Anne Curzan) the textbook How English Works: A Linguistic Introduction 3/e (Pearson, 2012). 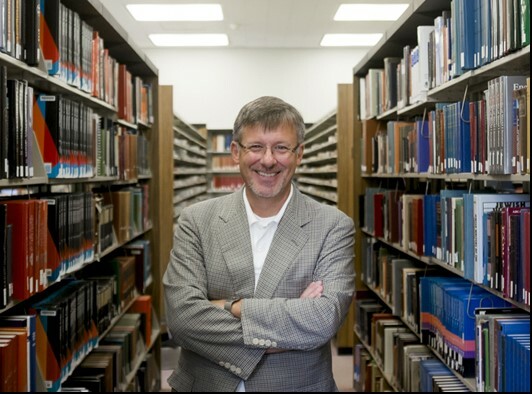 He is formerly editor of the journals Dictionaries and American Speech and past president of the Dictionary Society of North America and is currently vice-president/president-elect of the American Dialect Society. Also, he is a nice guy with a wonderful spouse — Jennifer — two lovely children — Ollie and Amelia — and a cat named Bruce. He works for fun, as well as a paycheck.